Dr. Joshua Jones is most passionate about creating smiles that are not only beautiful, but functional as well. It is his goal to have each patient’s teeth look good and fit together as best as possible. For Dr. Jones, the positive effects that a straight smile makes in a person’s life are what he most appreciates about his work. Dr. Jones is involved in continuing education throughout the year, going well above and beyond what is required by the state board for licensure. 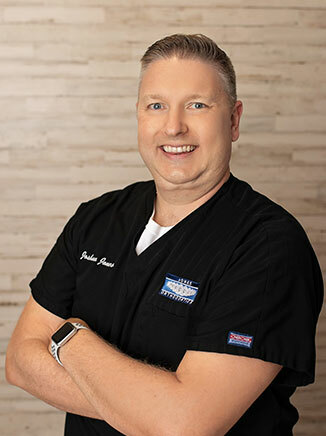 He takes courses in both orthodontics and general dentistry to stay informed of the latest techniques and technologies in not only orthodontics, but all of dentistry. This allows for the best treatment plan to be formulated for each person’s unique smile needs. A native of St. Charles Parish, Dr. Jones currently resides in Metairie with his wife Wendy, children Katelyn, Kristina, Matthew, and Sophia, and a cocker spaniel named Lady. He is dedicated to his family, giving each of his children the time and attention they need and deserve. When he’s not in the office, Dr. Jones loves to travel, though it can be a challenge with four children! Having spent his residency in Florida, Disney World is hands down the family’s favorite destination. Even though the kids keep them quite busy, Dr. Jones and his wife try to devote time and volunteer with various ministries at their church, St. Clement of Rome in Metairie. They feel it is important for children to learn to serve others at an early age, so they may continue to do so as they get older.